Dulwich College in south London was established in the 17th Century and is famous not only for its superlative academic provision, but also for its historic buildings including the impressive Great Hall. The Hall is the centrepiece of the school community and was designed around 1870 by Charles Barry, whose father designed the Houses of Parliament. 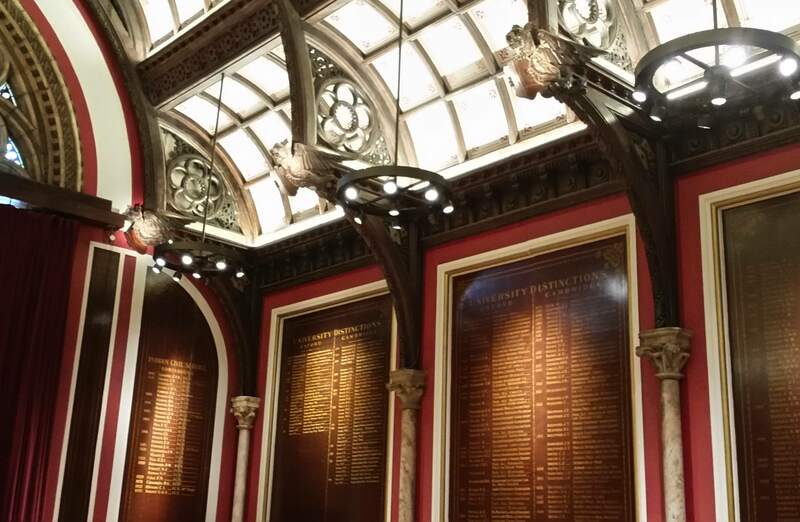 Recently Dulwich College’s COO Simon Yiend led an initiative to reimagine the lighting design in the Great Hall to help restore its original perspective. This included making this spectacular room’s lighting more appropriate to its heritage whilst improving energy efficiency. Dernier & Hamlyn was asked to utilise the knowledge which our engineers and craftsmen have amassed over many years to propose an appropriate solution. We recommended installing the light fittings on rods that were attached to the ceiling at the same points as Barry’s gas lights to minimise the effect on the building’s structure while optimising lighting levels. We manufactured twelve decorative chandeliers in which LED fittings supplied by Light Projects were fitted. The chandeliers were hand finished in brushed bronze by our artisan team so that their colouring complements the Great Hall’s woodwork. Light Projects’ fittings incorporate swivel housings that can be adjusted to highlight the room’s many noteworthy features, including academic honours boards and architectural features such as the impressive vaulted ceiling and historically important gargoyles.